TELLURIDE – It’s cold. It’s February. And it’s time for Valentine’s. 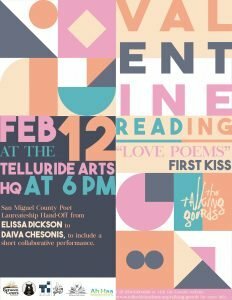 The Telluride Institute’s Talking Gourds poetry program is hosting a pre-Valentine poetry reading specially reserved for love poems. “I’ll bring a trove of love poems by good poets if people want to read selections of others,” said Talking Gourds co-director Rosemerry Wahtola Trommer. She noted that the gourd will pass several times that evening, so those in attendance will get a chance to read several poems over the course of the night. Valentine Reading will take place Feb. 12th at 6:00pm at the Telluride Arts HQ. Elle Metrick is hosting an informal Talking Gourds gathering at the Meadowlark House in Norwood on Feb. 11th starting at 6:30 p.m. Call her for more details, 970-729-1681. In addition to our regular Talking Gourds poetry club series, Lucinda Carr of Mesa Canyon Studio will host a special reading by her friend Madelyn Garner on Sunday, March 3rd starting at 11 a.m. at Ah Haa’s Daniel Tucker Gallery in Telluride. A complimentary light brunch and mimosas will be served. Garner’s most recent book is Hum Of Our Blood (3: A Taos Press, 2017 C.E. ), about the death of her son Bradley from AIDS. For more information, contact Carr at lucindacarr@mesacanyonstudio.com. Also in March, Tori Miner of Grand Junction will be our featured guest for our Poetry Club series on Monday, March 18 at 6:30 p.m. in Norwood at the Meadowlark House and Tuesday, March 19 at 6 p.m. at Telluride Arts HQ. The theme will be Dreams. In April, during National Poetry Month, we’ll be hosting Kathleen Cain of Denver on Monday, April 29th at the Meadowlark House at 6:30 p.m. and Tuesday, April 30th at Telluride Arts HQ at 6 p.m. The theme will be Cottonwood Trees. In May, Talking Gourds will co-host with Between the Covers Bookstore the 6th annual Telluride Literary Arts Festival. Submissions for the $1000 Fischer Prize (national) and $500 Cantor Award (Colorado) are now being accepted at www.tellurideinstitute.org/talking-gourds. Poetry club members in good standing get a half-price discount on submission fees for those prizes. Talking Gourds programming survives through the generous support of private donors and Club members. There is a one-time fee of $25 to join the Talking Gourds Poetry Club. That makes you a full member for a year and gets you on our cyber mailchimp list for readings, festivals and contests. And it means that you are one of those generous supporters who believes in the importance of the arts on the Western Slope. A $10 annual renewal fee keeps you up to date as a full member, renews your subscription to our private email newsletter, and gives you half-price for Fischer Prize submissions and free Poetry Club broadsides. Go to www.tellurideinstitute.org for Talking Gourds page and donation buttons. Talking Gourds Poetry Club, Gourd Guests, the Telluride Literary Arts Festival, the Western Slope Poet Laureate and the MycoLicious MycoLuscious MycoLogical Poetry Show are collaborative projects of the Telluride Institute — in partnership with the Wilkinson Public Library, Between the Covers Bookstore, Ah Haa School for the Arts, Lithic Bookstore & Gallery, Telluride Arts, the Telluride Mushroom Festival, and our club members. Talking Gourds is indebted to generous contributions past and present from Audrey Marnoy, Peter Waldor, the Cantor Family of North Carolina, the late Elaine Cantor Fischer and her many friends, Eduardo Brummel, Daiva Chesonis, Elissa Dickson, Laura Colbert, Jess Newens, Judy Kohin, Rosemerry Wahtola Trommer, Danny Rosen, Kyle Harvey, Kate Jones, Pepper Raper, Molly Daniel, Elodie Jacobson, Tara Miller, Sam Brown, Elle Metrick, John & Maggie Metrick, Mar Boyd, Buff Hooper, Kyra Kopestonsky, Lee & Billi Taylor, Allyson Snyder, Amy Levek, David Oyster, Michael Olschewsky & Ruth Duffy, Rick & Marty Hollinbeck, and our many friends. Call 970-729-0220 (voice or text, but no voicemail please) or visit the Gourds website <www.tellurideinstitute.org/talking-gourds> for more info.